From the Unique Series of Drink in the Box. A super tight design of a matte black drink pack with golden accents. A durable Tritan drink pack with a content of 3.5 dL. Refill time after time with a drink or (fruit) water. Leak free, easy to keep clean and carry in a bag. The design of the Unique series focuses on (young) adults with this beautiful mat black drinking box with golden accents. Handy? Really! What do you think about just closing halfway and drinking again if you want to go on? It fits into the dishwasher , is leak free and reusable . Perfect for an on-the-go, a festival (take i ampty and (re)fill on site), vacation and then you're welcome to go to school or work. In our blog, " How to Clean My Drink in the Box ", you can read all about cleaning with the dishwasher or hand wash. Note: Drink in the Box can not be boiled out or cleaned with a steam cleaner, etc. This will cause distortion of the product. Place Drink in the Box on the top rack in the dishwasher, older models dishwashers are often to hot because of the heat spiral at the bottom of the dishwasher. 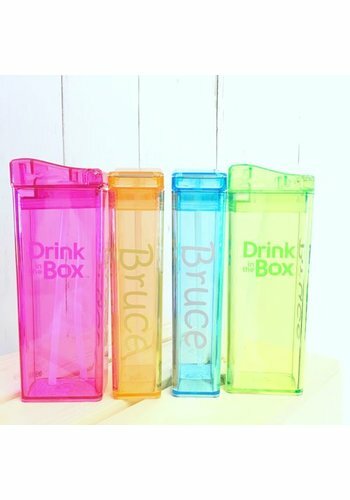 There are various accessories to be ordered at the Drink In The Box: decals to personalize your drink pack, cool packs to keep your drink cold and there are spare parts available. 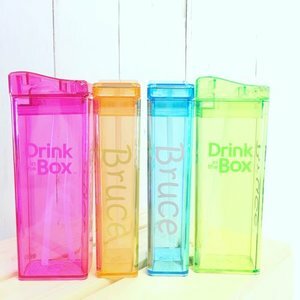 Want to know more about Drink In The Box (previously Juice In The Box) please read on here . The most frequently asked questions about Drink in the Box can be found in the factsheet . Here you will also find videos and background information. For the inspiration for fruit water, we gladly send you to my blog. Herein my top 10 fruit water recipes.